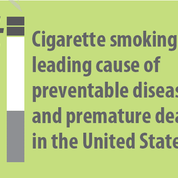 Smoking is the most preventable cause of premature death in the United States. 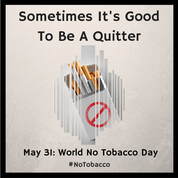 The World Health Organization created World No Tobacco Day in 1987 to encourage a 24-hour period of abstinence from all forms of tobacco use, and to spread awareness of the negative health consequences caused by tobacco. Tobacco use is a major risk factor for heart disease, stroke, cancer, and lung disease. About 20% of adult men and about 16% of adult women smoke. Cigarette smoking is the leading cause of preventable disease and premature death in the U.S.
Smokers are 12 to 13 times more likely to die from chronic obstructive pulmonary disease, a long term lung disease, than nonsmokers. In the last 50 years, an estimated 20 million Americans have died prematurely due to tobacco-caused illnesses. 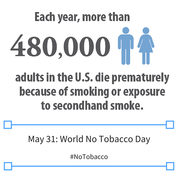 Each year, approximately 443,000 persons in the U.S. die prematurely because of smoking or exposure to secondhand smoke. Secondhand smoke exposure increases the risk for heart disease by 25-30%. Secondhand tobacco smoke contributes to about 34,000 premature heart disease deaths and 7,300 lung cancer deaths. Secondhand smoke contains 250 chemicals which are known to damage your health. Smoking not only takes the lives of those who use tobacco, but also those who are exposed to second-hand smoke. The bottom line is that no tobacco product is safe. More than 10 times as many U.S. citizens have died prematurely from cigarette smoking than have died in all the wars fought by the U.S. during its history. QUIT – almost immediately after quitting, the lungs and other smoke-damaged organs start to repair themselves. After 10 years – the risk for lung cancer drops by half. Exercise – Being physically active can help lower stress levels, improve moods, and reduce the urge to smoke. World No Tobacco Day is observed around the world every year on May 31.